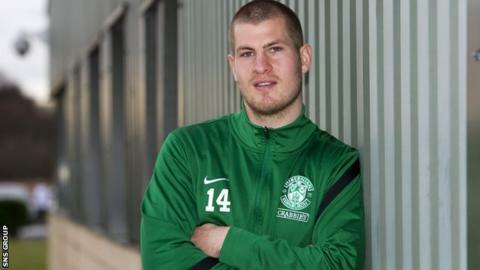 James Collins hopes a new emphasis on attack at Hibernian can result in him converting more goals. The striker has scored just twice since his summer move from Swindon but thinks recently-arrived manager Terry Butcher can spur the Edinburgh club to success. "Hopefully this is a turning point and, with a new style of play, we can get more crosses into the box," he said. "If we are being more positive and getting at teams going forward that can only benefit you as a striker." Butcher will oversee his first match in charge of Hibs at St Mirren on Saturday, having left Inverness CT perched in second place in the Scottish Premiership. Hibs are in seventh place and are the top flight's lowest scorers. Pat Fenlon, who resigned on 1 November, brought Collins to Easter Road in a £200,000 deal but the striker has struggled to fill the gap left by last season's leading scorer Leigh Griffiths, now back at Wolves after a loan agreement. Fiscal restraints mean transfers fees are rare in Scotland, with the vast majority of deals done under freedom of contract, but Collins insists that has not been playing on his mind. "Coming up here and learning a new style of play in a new league, moving my family up, it's difficult. "But I'm settled in now and I just want to get things right on the pitch. "The old gaffer had his regime and the new manager has got the way he wants to play. "So far, with the new way, getting in behind teams and being more confident, having more shots - I think that's definitely the way to go. "Everyone has got a clean slate and everyone wants to show the new manager what they can do. "The last week has been really intense and all of the boys are looking really sharp. "Hopefully, we can take that onto the pitch on Saturday. "This is a fresh start and if we do get the win on Saturday I think it could kick start our season and we can go into the Christmas period flying."